At the risk of waxing poetic as we begin our new year, I will simply point out that our canine friends have their priorities intact all year round. For Kenyan, it is chasing squirrels, deer and birds. For Scout, it is chasing Kenyon chasing squirrels, deer, and birds, and for Paws, at 14, it is watching Scout chase Kenyon chasing squirrels, deer, and birds. The week prior I finally finished installing that fence. 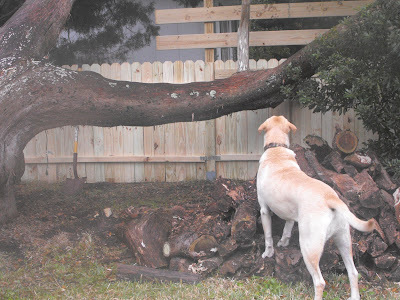 We cut around the Cypress tree on the right side of the house as it's trunk grew somewhat parallel to the ground and into the neighbor's yard. That last fence post was barely in the ground more when I saw Kenyon simply step up onto the old wood file sitting underneath it, onto the tree truck, and - you guessed it - right over that new fence. I spent the better part of last Sunday further securing that area to prevent any further flights of fancy. I removed most of the woodpile that day and will finish the rest tomorrow. Never a dull moment here in our new home in South Georgia. Of course Kenyon stepped right over the fence. I wouldn't expect less of him! Happy New Year to you and the kids! Buon anno nuovo a te la mia bella amica! Happy New Year! I thought of you twice this past week-as we drove down to Florida day after Christmas and on the way back when we passed through south Georgia. Out the window-what did I see? -the "blue moon" what a sight. We had gorgeous weather in southern Florida but it was quite cold in south Georgia on the 1st. Love the labbie story- So far Logan is like Scout-but if she saw a deer, the Kenyon would take over, I am sure!